A maternity resignation letter is a type of resignation letter that is handed out by a female employee who is pregnant or is suffering from a serious post-pregnancy illness or health problems. There are several reasons why a pregnant woman may opt to resign from her job and those reasons will be discussed below in detail. 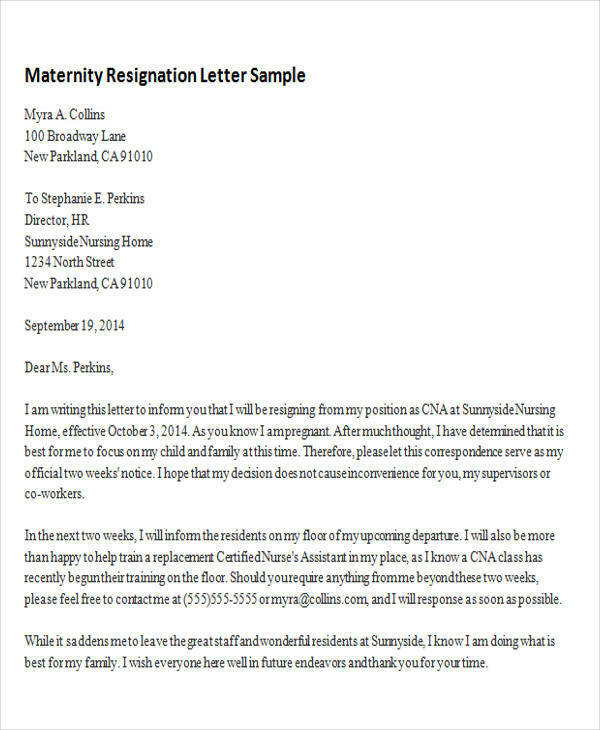 If you are planning to send a maternity resignation letter, then it is best that you pattern your letter on a standard format; You can find samples on this page that can help guide you through your resignation letter-writing. 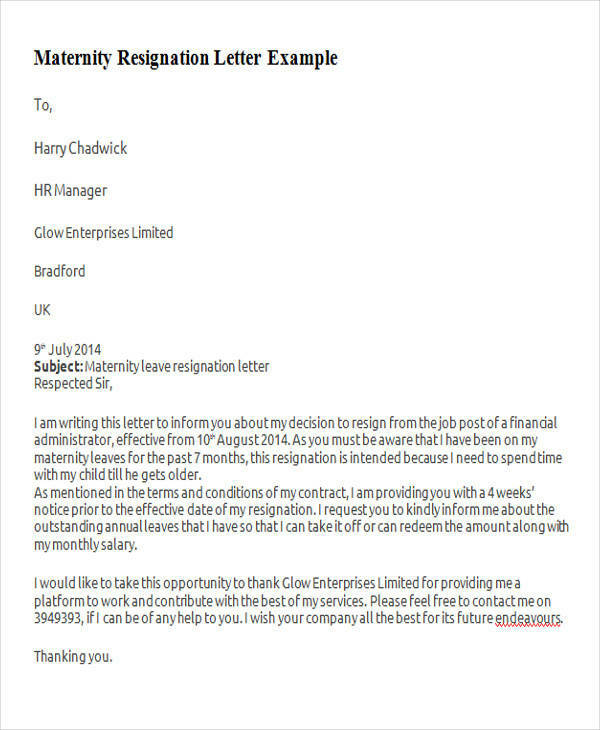 Scroll down below and download from our collection of maternity resignation Sample Letters. These letters are available in PDF and Word formats, thus making it easier for you to access these and alter these as you deem appropriate should you decide to use our samples. What Are the Parts of a Maternity Resignation Letter? 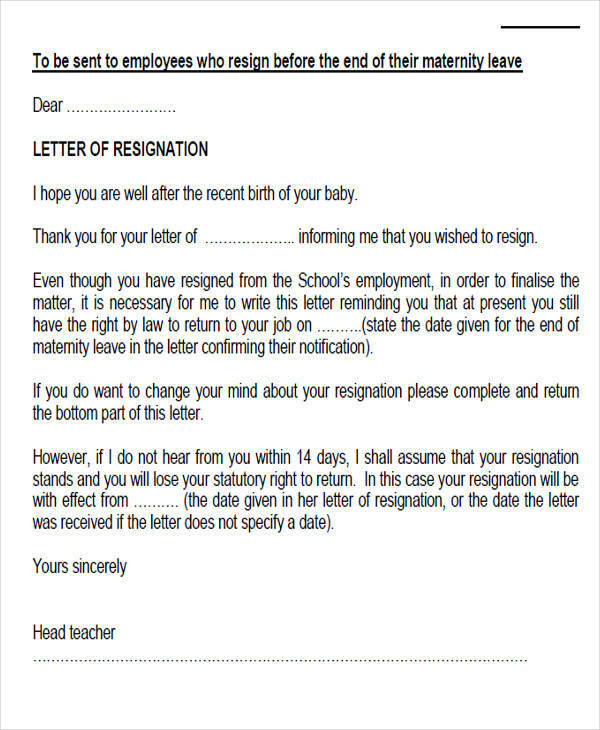 A maternity resignation letter may consist of a lot of parts depending on he contextual needs of the person who is planning to resign. If you think you need to add more information regarding the reason for your maternity resignation then you may do so. 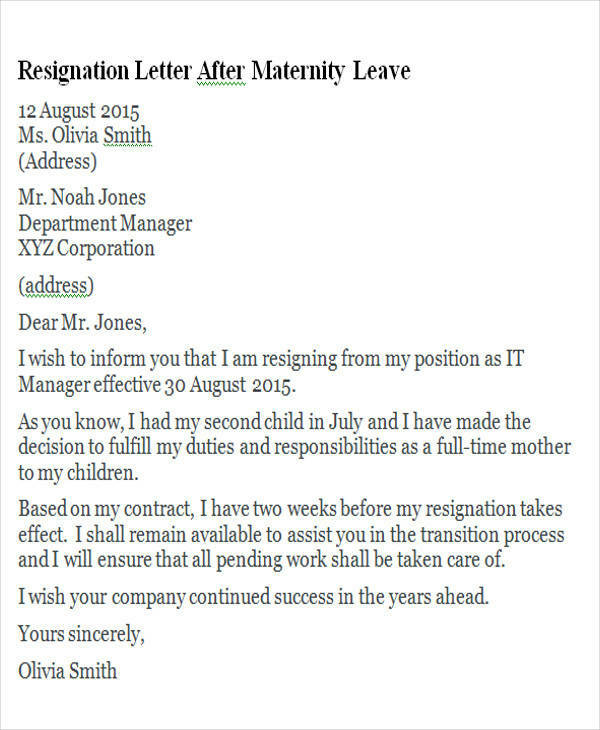 There are, however, some basic elements that a maternity resignation letter must have. A formal introduction. No matter how close you are to your employer or manager, it is always best to keep things formal in a resignation letter since it is a professional letter. A formal statement of your intent to leave your job on a specific date. A detailed explanation of why you want to leave your job after/before labor/conceiving your child. Attachment of some medical or psychiatric certificate if relevant to the reason purported in the letter. For more information about the elements of Professional Resignation Letters, check out our Immediate Resignation Letters, which is also another type of resignation letter. When Can You Submit a Maternity Resignation Letter? When the woman is suffering from grave illness or health complications after giving birth. When a woman is still pregnant but her condition requires her to avoid performing her normal working duties or other stressful and laborious tasks. Of course, when this is the reason, a formal certification from a doctor must be attached in the resignation letter. When a woman is suffering from postpartum depression as assessed by a mental health professional/psychotherapist or psychiatrist. Just like the medical condition, it is necessary that you provide a copy of a formal certification or document from a professional indicating the factuality of your postpartum depression. check your company policies regarding resignation and observe the standard processes mandated by your company as well as by the laws of the state. For more reference regarding resignation letters, you may check on our collection of Job Resignation Letters that are also available for free download. Simply click on the link provided.